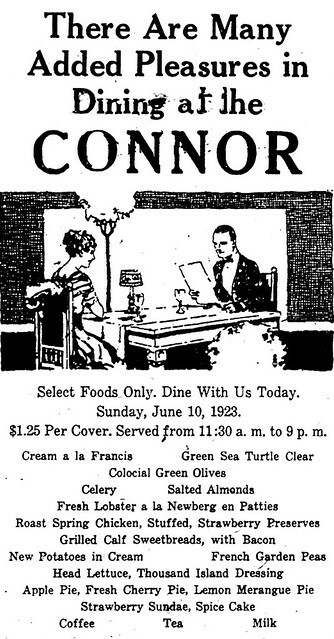 Another in our “Where to Eat Should You Time Travel Back to Joplin” series brings a menu from the Connor hotel in June, 1923. A little more accessible than the previous menu from the House of Lords, this time period marks the era when the Connor was the undisputed place to stay when visiting Joplin or passing through. In her lobby passed all famous men and women and below are a few things they might have enjoined at the Connor’s restaurant. This page took 0.344 seconds of computer labor to produce.